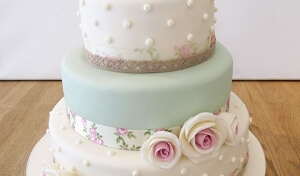 If you’re having a vintage themed wedding, a vintage style wedding cake is an absolute must if you want to complement your outfits, venue and floral displays. lthough modern cakes seem to be all the rage these days, with more brides and grooms opting for unusual choices like mounds of donuts and piles of profiteroles, there is still a healthy trade in traditional cakes with tiers, icing and tons of beautiful decoration. Here, we look at some of the best vintage wedding cake ideas for your special day so that when the bride and groom cut into it, they will know that every single part of their celebration has embraced the theme that they’ve chosen. What Exactly Is A Vintage Wedding Cake? There is no such thing as one type of vintage wedding cake. It could be round, it could be square. It could have two tiers, three or four. It could have a highly decorated top or it could be quite plain. The key to a vintage cake is choosing something that wouldn’t have looked out of place at your grandmother’s own wedding celebration. Professional bakers and confectioners of today who specialise in making wedding cakes often take their inspiration from some of the most beautiful wedding cakes of days gone by. Capturing the essence of bygone trends, vintage didn’t mean old fashioned, it just means timeless elegance. When thinking of vintage wedding cakes, you’re probably imagining a whole lot of tiers, and indeed three or four are most common, however it’s important to remember that in the old days, cakes were usually displayed with each layer connected to the next using a column for additional height rather than simply being piled one tier on top of the other which is so popular today. One of the best ways to decorate a vintage wedding cake is to use flowers as your basis. Forget the little bride and groom figurines – flowers are symbolic, with orange blossom and roses being the two top choices historically, since they’re linked to fertility, happy marriage and love. If you prefer sugarcraft flowers that would work too, but fresh flowers displayed between each cake tier is incredibly authentic and adds lots of natural beauty to your centrepiece. 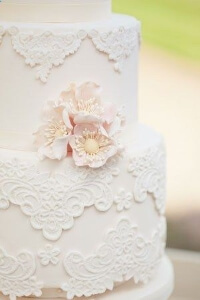 When it comes to vintage wedding cakes, lace is a top trend. Many bakers are now choosing classic wedding dress designs from the bride and groom’s chosen era and then recreating the intricacy of the lace with sugar for a delicate and stylish appearance. 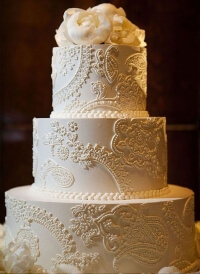 Alternatively, go down the real lace look, working the lace into the decoration around the cake’s tiers for a more natural and authentic appearance. If you’re having a 1950s themed wedding, you can go all out on the cake decorations. Fondant icing went out of the window with the end of rationing in 1947, and frosting became de rigeur. Royal icing too was very popular, and pearl detailing, shell borders and ruffle trims are the perfect accompaniment to any 1950s vintage themed cake. What Type Of Cake To Make? Although these days, contemporary wedding cakes could be anything as diverse as salted caramel or chocolate fudge gateau, cakes of yesterday were almost always fruit. High quality muscovado sugar paired with lashings and lashings of premium liquor and tons of juicy raisins, currants, cherries and sultanas are an absolute must for a truly original vintage wedding cake. Even better, if you’re making your own wedding cake, if you remember the prepare it 3 months before the big day and pour brandy over it, it will have more than enough time to soak in all those delicious flavours for a very potent mouthful after your wedding breakfast! Your guests are certain to be seriously impressed by any of these vintage wedding cake ideas, so whether you’re having a 1920s, 30s, 40s or 50s themed celebration, you will be able to find the perfect cake to complement the style of your big day. After all, there’s nothing your guests look forward to more after all those speeches than a large bite of a delicious piece of cake – you can be sure they won’t be disappointed with yours!